What is the environmental impact of deforestation for paper production? In this post, we’re focusing on deforestation in the name of paper production. What is deforestation? What’s so bad about it? And what can we do to help? This is the first in a series of blogs looking at the impact of the paper industry on our environment. We’ll be covering some of the big issues and questioning if, and how, we can rebalance our friendship with trees. Some of these items are steadily becoming outdated in favour of digitalisation, at least in some parts of the world. As we move into the thick of the 21st century many of us have trained ourselves to stop before printing out emails (seriously people!). But it’s still hard to imagine our lives without certain paper products. And the truth is about 14% of deforestation is done to satisfy our huge appetite for paper goods . This amounts to the destruction of around 4.1 million hectares of forest each year in the name of our paper obsession – an area the size of the Netherlands every 365 days. At Paper on the Rocks we do not find this acceptable. Do you? Not sure? Read on to discover why we want to put an end to deforestation and the polluting pulp and paper industry. What is deforestation? And why do we do it? And, of course, providing the paper industry with wood pulp to turn into paper and cardboard products, our focus today. What’s so bad about deforestation and, in turn, the paper industry? The majority of the world’s biodiversity (the huge array of insects, birds, mammals, reptiles, amphibians, plants and trees) lives in, and depends on, forests. This is where it’s evolved over hundreds of thousands of years. Deforestation can wipe out huge swathes of this incredible richness within a matter of moments. According to the WWF’s recent Living Planet report, the current levels of deforestation make the species living in our rainforests some of the most endangered in the world. Trees keep us alive. They create the oxygen we breathe and remove and store harmful carbon dioxide, helping to reduce global warming. We are utterly dependable on them. It’s as simple as that. As mentioned above, trees store carbon dioxide, which is released when cutting them down, burning them or making them into pulp for paper production. And, as you might expect, this contributes to global warming. Scientists estimate that 23% of man-made carbon dioxide emissions are as a result of the loss of forests . This is far more than the amount created by all the cars and lorries on our roads, estimated at 14% by the World Car-free Network. Sure, offsetting the destruction of centuries old forests by growing new ones is better than doing nothing at all. In some cases. When we grow new forests thoughtfully, with biodiversity at the forefront, and when we then protect these trees from further deforestation. But replacing the richness of an older forest’s biodiversity and high-quality soil with fast growing monocultures (lots of one type of tree all growing side by side), fuelled by desire to make money, can have devastating effects. For example, the deadly forest fires Portugal has endured over the last few summers are largely caused by the planting and mismanagement of Eucalyptus trees. These trees are fast growing, great for cutting down to make wood pulp, but terrible for biodiversity because they make it very hard for other types of trees to grow alongside them, and even insects don’t like them. They’re also highly flammable due to their natural oils. So what can you do to help rebalance our friendship with trees? How can you offset deforestation in a meaningful way? It’s not all doom and gloom – there are success stories (several can be found in this opinion piece in the Guardian) – and there are some big players determined to change things for the better, such as the Norwegian Government, which banned deforestation in 2016 . But if we want things to change we all need to be involved – as individuals, citizens of the world, workers, business owners and politicians. Start with a week and see how long you can keep it going. This will mean refusing unnecessary packaging, leaflets and paper tickets. 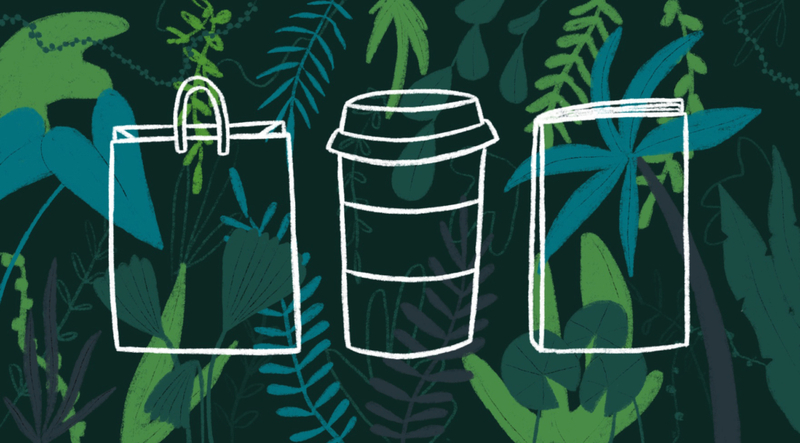 We’ve all been talking about using fewer single-use plastic products – the same goes for pulp and paper products. Buying something new? Whether it’s a t-shirt, notebook, piece of meat or pack of tofu, ask questions. Look for answers online, ask in store or contact the producer directly. Where did it come from? Was it made fairly, without human suffering and the unnecessary use of precious resources? If you’re not satisfied with the answers, is there a more sustainable alternative available? WWF’s recently released Living Planet Report 2018 looks at the importance of biodiversity, the impact of deforestation, and much more. A New York Times’ report on Portugal’s forest fires in 2017, looking at the causes and the impact on local communities. Greenpeace has information on their website about deforestation and how you can get involved in their campaigns.